Sean Connery returns and the series pivots towards heavy camp in the 7th James Bond film – Diamonds Are Forever. “Outrageous fun-making thrills!” promises the trailer, as well as heralding the return of Connery (making a record payday) after Lazenby’s one-film stint as 007. And while the more jocular tone is fun at first, Diamonds Are Forever curdles into a different, more off-putting beast the longer it drags on. Shirley Bassey returns as a Bond songstress following the wildly successful Goldfinger theme. It’s not fair to compare the two, but Diamonds Are Forever is still a standout song buoyed by suggestive innuendo and a bravura vocal performance, married to lush and sparkly production (later to be sampled by Kanye West among others). The opening features the awaited return of Connery as Bond, and he quickly re-establishes his brutish ways by first seducing a woman then throttling her for info (“There’s something I’d like you to get off your chest”). 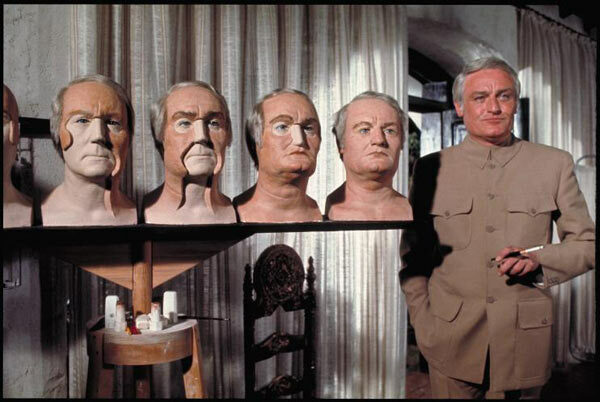 Bond is hot on the trail of Blofeld (still), who’s inexplicably played by Charles Gray here. After interrupting a weird mud ceremony, Bond seemingly kills Blofeld (“Welcome to hell!”) as the opening credits roll. The actual specifics of Diamonds Are Forever, which involve diamond smuggling, dopplegangers, and the Vegas mob, are convoluted and nonsensical. The plot serves (more than ever) as a flimsy excuse upon which to hang various globe trotting set pieces, making the film seem less like a movie and more like a sequence of vaguely connected scenes. The fact that returning characters like Blofeld and Felix Leiter are again played by different actors doesn’t help, and even Connery seems bored of the role that gave him worldwide fame. I will say this for Diamonds – there’s plenty of action to be had. Now, much of it is goofy and often weightless, but it’s there nonetheless. There’s helicopters galore (which seemingly exist only to be blown up), a great close-quarters elevator fight, and not one, but two chase sequences. The first is a downtown Las Vegas car chase that showcases both early 70s muscle cars and the bright lights of Sin City in fine fashion (and culminates in a nifty two-wheeled stunt). The second chase finds Bond stealing a moon lander in the desert of Nevada, is patently ridiculous, and likely should have been excised from an already silly film. Mr Wint and Mr Kidd – the most offensive henchmen yet? And special mention should be made of Mr. Wint and Mr. Kidd – two assassins on the trail of Bond throughout the film. Their quirkiness and seeming politeness is suitably unnerving (like a Coen Bros’ villain), but they’re also totally regressive stereotypes of homosexuality. After offending various ethnicities in previous films, producers thought it was time to move on to sexual identities. Their scenes are almost so over the top that it’s comical (they skip away hand-in-hand, Mr Wint mentions “She’s attractive, for a lady”), but it still skirts the line of good taste. I’m guessing this stuff played better in the 70s, but we’ve come a long way. Some mobsters hassle Bond as well, but neither they nor Blofeld ever come off as tangible threats in Diamonds. In fact, Bond mostly breezes his way through the movie, rarely coming up against significant resistance. It’s like a victory lap for Connery. Tiffany Case (played by Jill St. John) is the main Bond love interest here. She’s an avaricious diamond smuggler that Bond uses and seduces, although she does play a significant part in the climax when she smuggles a MacGuffin in a tiny bikini. She also has the distinction of being the first red-headed Bond girl, which James doesn’t let pass without comment. In addition to Case, Bond encounters the hilariously named Plenty O’Toole (“Named after your father perhapsh?” Bond quips) at a craps table. She really gets the short end of the stick as she’s both chucked out of a window into a pool (Bond: “Exceptionally fine shot”, Thug: “I didn’t know there was a pool there”) and eventually killed. There’s also an acrobatic fight scene with two female thugs by the name of Bambi and Thumper. They pulled out all the stops with the names in this one! Las Vegas is a novel setting for much of the action, and the gaudy lights and cool architecture translate well to the big screen. to avoid undue suspicion in Amsterdam BOND MAKES OUT WITH HIMSELF. I couldn’t find a clip or picture so you’ll just have to take my word for it. Diamonds Are Forever is a case of “be careful what you wish for”. After the under performance of On Her Majesty’s Secret Service (and Lazenby stupidly quitting the role of Bond), producers were eager to lure back Connery and return the series to a more upbeat tone. Unfortunately Connery was saddled with a disjointed script that leaned a little too heavily on one-liners and not enough on character building or believable action. At times it’s so bad it’s good, but often it’s just bad. Diamonds makes OHMSS look better in retrospect and is easily Connery’s worst outing as Bond. An ignoble end to an illustrious spy career, it would cause the need for another reboot and set the stage for a new actor’s tenure as 007. ← INSIDE OUT Review: Pixar’s Best Yet?